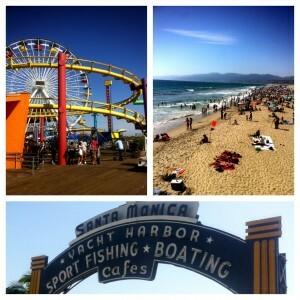 Today we met up with Nema and Liv at the Santa Monica Pier. We love coming here and walking down the pier, passing by vendors, fishermen and performers. There were a ton of people out on the pier today, probably because it was such a gorgeous Southern California day. One of the more “interesting” acts on the pier was two men that had a very large yellow snake, like the one Brittney Spears had, and was letting people take pictures with it. Gross! We had a great time hanging out, playing some games (Nema unfairly won twice!) and Ke’alohi even got to go on a ride! Remember the humongous yellow snake that Kainoa took a photo with at the Iowa State Fair when he was 7 years old?!? His name was Bob! Ewwwww!